Whether it be a Whole House Central Air Conditioning System that you prefer, or the Ductless Mini Split System, R.J. Riquier Inc. has the training and expertise that you want from the technicians who can turn your living space into year-round comfort. • R.J. Riquier Inc. – is an Authorized Mitsubishi Contractor! • Save Energy & Money – with ductless systems that use 25% to 50% less energy to heat and cool your home. • Year-Round Comfort – from a single heat pump system that provides both air conditioning and heating, eliminating hot and cold spots in your home. 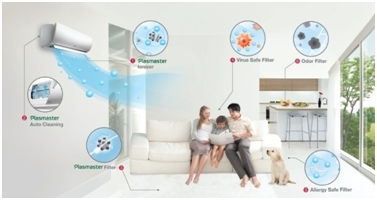 • Allergen Filtration – reduces germs, bacteria and viruses while absorbing odor-causing gases to give you cleaner, healthier air. • Ultimate Comfort Control – in the palm of your hand to set cooling or heating mode, temperature and fan speed in each room. • Low Cost, Easy Installation – that is quick, simple and inexpensive. Visit our “Rebates” page to see the tax credits and instant rebates available for these high efficiency products! • Split System Lineup – Two main components – outdoor and indoor that work together to provide top performance, maximum efficiency and comfort for those dog days of summer. • The 15/16 SEER (Seasonal Energy Efficiency Rating) System – ENERGY STAR rated for extra high efficiency comfort and eligible for tax credits and rebates. Visit our “Rebates” page! 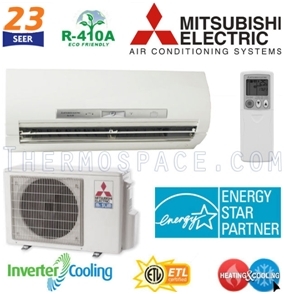 • Combine With Heat Pump or Furnace – for year-round comfort and quality that’s affordable.